We have retained several heifers the last few years and need to sell several cows to make room for them since we are limited on pasture. We have two zebu cows that have already weaned their last calves and should already be bred back to our red lowline bull, Willie. Their calves will be polled and most likely brindle colored or tiger striped. We are asking $800, obo. 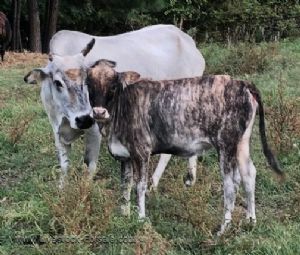 We have a few other zebu cows with calves that will also be available once their calves are weaned. I have 19 guineas that hatched in June. Asking $15 each or will trade for katahdins. We have been raising Texas Dahl Sheep on our farm in Missouri since 2011. We are members of the UHHSA and are inspected yearly by USDA. All of our sheep are Genotyped at age 3 months. 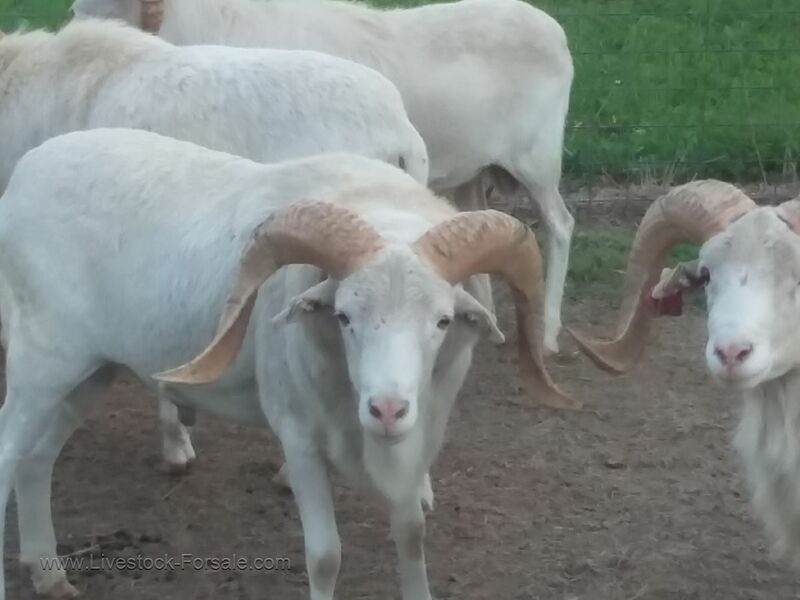 We have several very nice 1-1/2 to 2-1/2 year old Texas Dahl Rams for sale along with several 6 month Rams and ewes. Call for pricing. 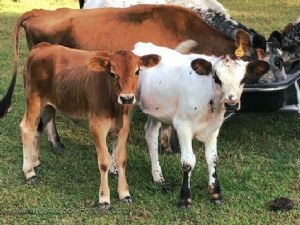 We have 3 miniature jersey bull calves available at this time. The darker fawn calf is 7/8 mini jersey x 1/8 dexter. 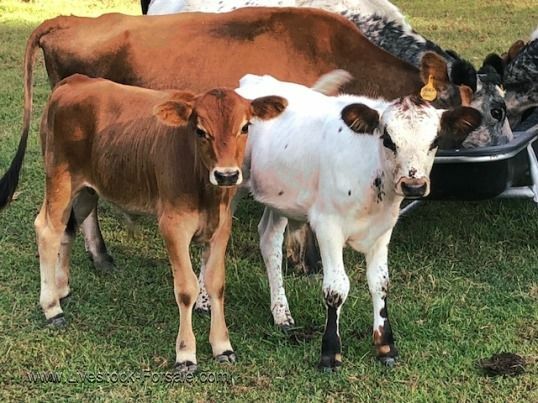 The lighter fawn calf is 3/4 mini jersey x 1/4 zebu. The white spotted calf is 1/2 mini jersey x 1/4 lowline x 1/4 guinea PineyWoods. 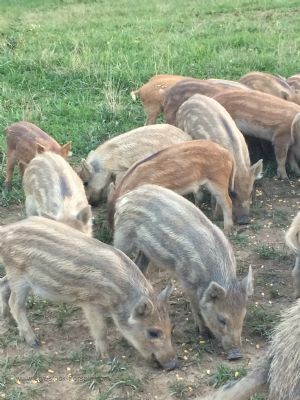 They are $900 each. We changed bulls last fall and should be having unrelated calves soon. Paradise Valley Farm located in Cleveland, GA has an adorable mini pig male looking for a loving home! Super sweet and adorable, easy to train, smart and just plain adorable! Price reduced to $450. Parents are AMPA registered. This male was born 4/16/18. 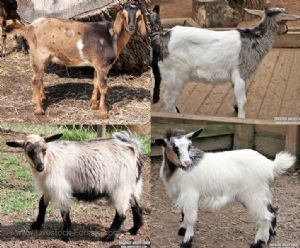 Mini Goats-Only a few left! 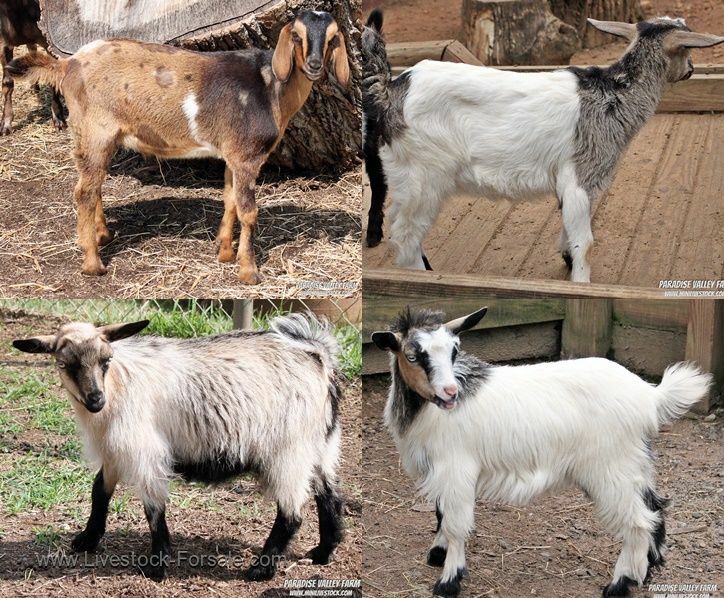 Paradise Valley Farm, located in Cleveland, GA has some adorable miniature goats available! We have 1 male Mini Nubian, 1 male Silky Fainter and 2 female silky fainters left! 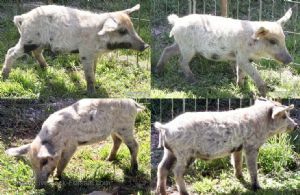 Young 3 to 4 month old European Boar (Russian) for sale $300.00 ea.